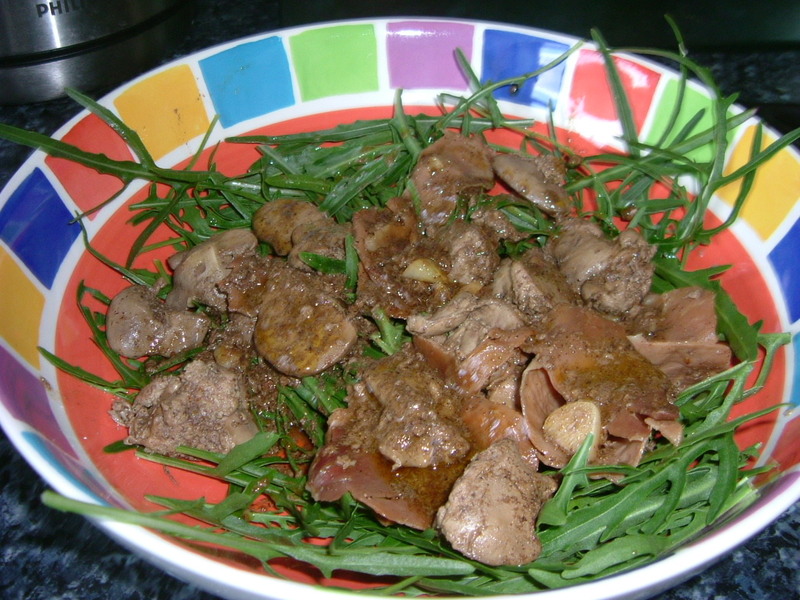 So for a couple of days now, I’ve been hankering to cook chicken livers, I’m not sure why it might be this post on Flavourgasm http://foolingaroundinthekitchen.blogspot.com/2010/06/chicken-livers-on-sherried-risotto-with.html. But I wanted to cook them, so I wandered down my village to my butchers and got myself half a pound of chicken livers, it was 77p, SEVENTY SEVEN PENCE, I was amazed. Another amazing cheap meat available at my butchers is Lamb neck, at £2.99 for 3 it was great value and they braise very nicely. Now what to do with them? I liked the idea of the risotto but I don’t have truffle oil, so I looked around and found an interesting recipe in an old good food for Baby spinach and chicken liver salad. I moved some bits around and this is what I got. Trim the liver of any sinews and cut into bite size pieces. Heat oil in a large frying pan. Add bacon and fry for a few minutes, add the finely chopped garlic and cook for a further 2 mins. Add the spice, and fry for another minute. Reduce heat and add the chicken livers, season and cook till crusty on outside and pink in the middle. Add the sherry vinegar and stir, in then add a splash of wine, simmer to get a thickish sauce. Place the livers and bacon onto the rocket and reduce the sauce down further. Then drizzle over the top. Enjoy as a light bite or a side dish on a warm summer night like tonight. Liver is lovely and cheap but this meal makes it seem expensive.